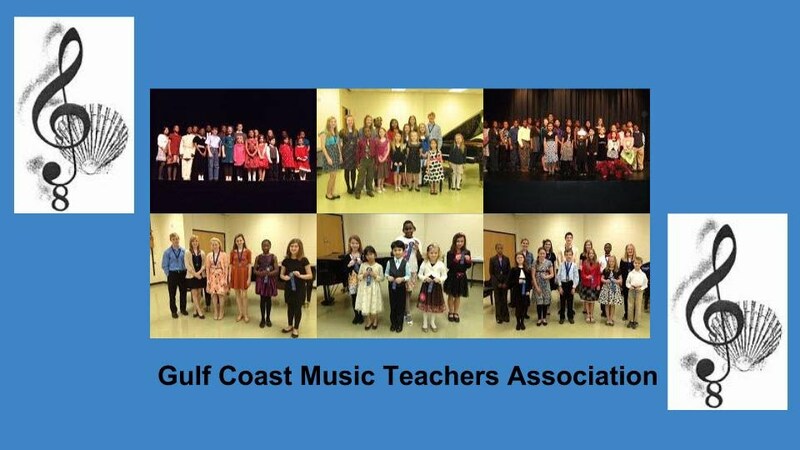 The purpose and goals of the Gulf Coast Music Teachers Association are to further the art of music, and to promote fraternity, growth and professional development of its members by providing programs that encourage and support teaching, performance, composition and research in music. GCMTA is a non-profit organization that supports the advancement of musical knowledge and education. Activities of GCMTA are aimed at the promotion of the art of music, the advancement of musical educational activities, and the appreciation of music among the people of the community. The fiscal year of GCMTA shall commence on July 1 and end on June 30. The membership year for all membership categories shall be July 1 to June 30. Annual dues for GCMTA shall be the total sum of prevailing national, state and local dues and shall be due on the first day of the membership year. Dues for the "upcoming" school year are accepted beginning in March of that year. In order to enter students in MMTA (state) and/or MTNA (National) competitions, annual dues must be paid no later than the first day of September. New members can join through December 1 with full privileges.